Maybe it was my first PowerBook that ruined traditional mice for me forever. The first few generations of PowerBooks came with a little trackball as its built-in pointing device—that’s right, Macs didn’t get trackpads until the PowerBook 500 series in 1994. 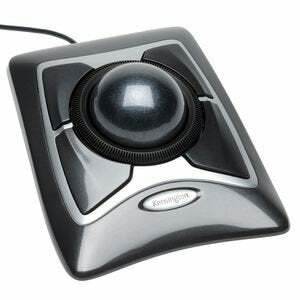 And then a departing co-worker bequeathed her Kensington trackball to me for use on my desktop Mac. As a result, I used trackballs as my primary Mac pointing devices for years; my house is still littered with Kensington Expert Mice. I switched to Apple’s Magic Trackpad a few years back. But when my wife and I set up Macs for my kids to use, those trackballs went back into service. What this means is that my children have a distorted view of how one controls the cursor on a desktop computer. Sure, at both home and school there are laptops with trackpads, and at school there are also desktop Macs with actual mice. We even have a random Mighty Mouse in the house. But most of the time my kids spend on the hand-me-down Macs they use to play Minecraft and do homework, they spend pointing with trackballs. They both got accustomed to using the trackball with ease. I subscribe to Dan Frakes’s theory that mice are for old people (like me, except I don’t like them either) and that the younger generation is more likely to prefer trackpads or even trackballs. When pressed, my kids could use the Mighty Mouse, but only under protest. Sadly, for the last few weeks my daughter’s trackball has shown all the signs of dying the True Death. I tried to swap in parts from a different, already-dead Expert Mouse in the hopes we could keep it alive, but in the end, it went to the great mousepad in the sky. So we needed a new pointing device in the house. But what would it be? A new Expert Mouse would cost about as much as a Magic Trackpad on Amazon, and there are plenty of traditional mice out there, too. I knew that my children wouldn’t blink if I just replaced one Kensington trackball with another, but I was curious if they were using the trackballs under protest or if they really, truly preferred them. So I asked. My 12-year-old daughter said that she much preferred the trackball to a mouse, but she also liked to use a trackpad. She rated trackpad and trackball evenly, with perhaps a very slight preference for the trackball. My eight-year-old son similarly gave a thumbs-down to the mouse—his desk is small and there’s not a lot of mousing room there—but said he preferred the trackpad to a trackball. “I think the mouse isn’t very good,” he confided. My wife’s theory is that for a long time, when he wanted to use the computer it ended up being my wife’s MacBook Air, which of course uses a trackpad. As a result, he’s logged many more hours with a trackpad than my daughter. That familiarity might have been enough to tip the scales in the favor of the Magic Trackpad. So in the end, I decided to transfer my son’s trackball into my daughter’s room and ordered a new Magic Trackpad for my son to use. After a week or so, things are going well. My daughter’s still rolling her way around, and my son is content to click with one or two fingers. Much has been written about how my children’s generation, raised on touchscreen devices like the iPhone and iPad, will look back on traditional computer interfaces with curiosity and bemusement. That may well be, and my kids do love using iOS devices—they use them far more than they use our Macs. But even with this generation, there seems to be an understanding that sometimes the big computer is useful. When my daughter was home sick from school one day, she watched Netflix on the iMac’s bigger screen. I asked my son if he’d prefer to play Minecraft on an iPad or a Mac. Now, the iOS version of Minecraft pales in comparison to the Mac version, so I asked him to imagine if the two versions were completely identical. He said he’d definitely prefer playing on the Mac, though a lot of that had to do with the Mac having a larger screen. I haven’t yet prompted either of them to try to type a document on an iPad with an external keyboard—my guess is that they’d find it more kludgey and unpleasant than just using the Mac to do those tasks. I wish I could finish this report with a definitive finding: Yes, it seems to me that kids have fallen in love with the trackpad, or disdain anything that isn’t an iPad, or something like that. But in fact, at least in my house, the children have done exactly what their parents have done: They’ve embraced the right tool for the job. Sometimes that’s iOS, and sometimes that’s a Mac. The only thing I know for sure is that nobody in my house likes traditional mice at all.